Marie Cardinal was born to a well-to-do French family that had lived in Algeria for many years. After her parents divorced when she was a baby, she was brought up by her mother and attended Roman Catholic schools. She graduated from the Sorbonne with a degree in philosophy. In 1953, she married Jean-Pierre Ronfard, a theater director, with whom she had three children, and taught in French lycées in several cities, including Salonika, Vienna, and Lisbon. The family emigrated to Canada in 1960; Marie and her children moved to Paris in 1969, while her husband remained in Montreal. She became a journalist and ghost writer, and worked on several French films. Beginning in 1962, she published three novels and the book Cet eté-là, an account of her filmmaking experiences. 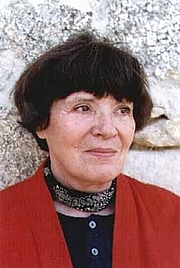 Her subsequent novels La clé sur la porte (1973), Les mots pour le dire (English translation, The Words to Say It, 1975), and Les grands désordres (1987) were bestsellers. Marie Cardinal is currently considered a "single author." If one or more works are by a distinct, homonymous authors, go ahead and split the author. Marie Cardinal is composed of 3 names. You can examine and separate out names.